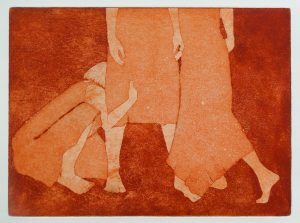 This collaborative traveling exhibition features original prints by artists from four, artist-run printmaking workshops in Yarmouth, Annapolis Royal, Mahone Bay and Church Point. The exhibit is visiting each of these communities over a one year period. This amazing collection of over 100 prints from more than 40 printmakers in South West Nova has provided a wonderful opportunity for artists to work together and to see first-hand the exciting new work of their printmaking peers while engaging visitors at each venue in demonstrations, workshops and artist talks. Mixed media artist, Jenny Carton and painter, Barbara McLean come together to present MIXING IT UP, a richly textured and lively coloured feast for the eye. Carton’s subtle tones of silver, black and grey on grounds varying from aluminum to hand made paper are often punctuated by natural stone or rusted metal. 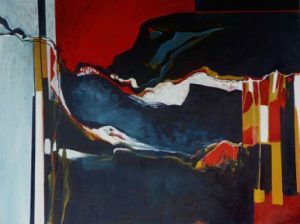 Her work provides a natural foil for McLean’s more traditional use of acrylic on canvas. However, McLean also expands on the use of traditional painting materials by including tea, coffee and drawing media in her paintings. In this rich and varied exhibition, it is obvious that there are wonderful contrasts and connections achieved by “mixing it up”.